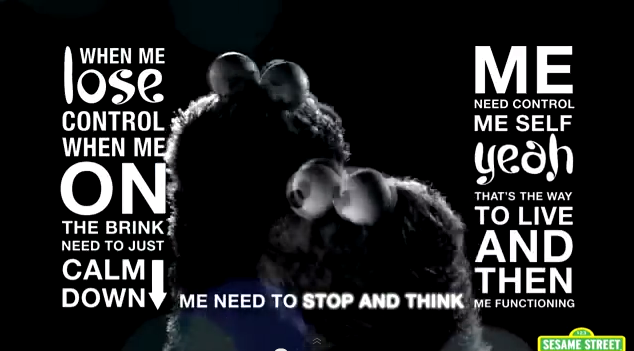 Weighty Matters: Will Cookie Monster's Latest Video Reinforce Weight Bias? Will Cookie Monster's Latest Video Reinforce Weight Bias? “Me get this feeling when me see a cookie on a plate. Me want to grab it but to eat it, oh me no can wait. But now me know that self control is something me must learn. Me want to grab it but to it, but me wait. Those are the first lines of the new Sesame Street Cookie Monster musical video that according to Sesame Street is about teaching pre-schoolers about delayed gratification and "self-regulation". Are pre-schoolers really a population who should be thinking about "self-regulation"? Having been through 3 of my own pre-schoolers I'm dubious that there's a pre-schooler on the planet who will learn to "self-regulate" treat consumption consequent to this video (and let's be fair here too, despite being on film Cookie Monster himself only holds out for 2 minutes and 46 seconds), however I do think plenty will learn that those who can't resist cookies lack self control. I worry a little bit about that last message as no doubt society will teach them that that's exactly why people are fat - too many cookies and other treats and by extension, lots of wanting it but little waiting, aka gluttony (a message I've seen taught in many G rated cartoons and movies). So I can't help but wonder whether this video will serve as further cement for future schoolyard weight bullies' unconscious drivers. Or maybe I'm just way too keyed into this stuff.